The remaining Pythons put on a fitting farewell show. 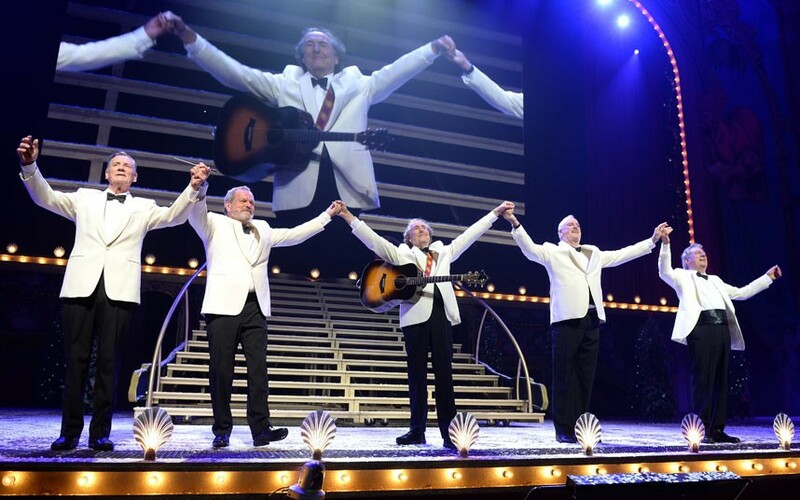 Broadcast from the O2 Arena in London to cinemas around the world, Monty Python Live (Mostly) included many of the comedy troupe’s classic sketches and hit songs, although they weren’t always done in predictable ways. Some have been updated with current references, but others remain the same and are as funny as always. The parrot may have passed on, but the members of Monty Python are not dead yet (mostly), and they joked that the subtitle of the show is One Down, Five to Go. This epic comedy reunion was the perfect way for the remaining Pythons to perform together for one last hurrah. The “female Python” Carol Cleveland also joined them and reprised her role in “The Lumberjack Song,” among others. Although their Flying Circus has been off the air since 1974, and the Pythons haven’t done a stage show since 1980, their impact on pop culture is immense and has trickled down through the generations. Many of my favourite Python sketches were re-enacted on stage, and it was wonderful to see them fall right back into their old characters. During the Dead Parrot sketch, Cleese added a line saying that the bird had “gone to meet Dr. Chapman.” There was also some great banter between Cleese and Palin as they moved in and out of the sketch, and while in the pet shop they had some fun with the Cheese Shop sketch. We were also treated to a great argument, as well as another favourite, the Lion Tamer sketch with the accountant which led straight into the classic “Lumberjack Song” where Palin proudly sang “I chop down trees, I wear high heels, suspenders and a bra.” Speaking of cross dressing there is plenty of that in the show as well. Know what I mean, eh? Say no more, say no more, say no more. Maybe they have run out of money, or maybe they have succumbed to public demand, but whatever the reason, I’m thrilled they are back on stage for one last show. The cinema was roaring with laughter almost the entire time, and for long time Python fans, this will give them the sense of closure that they need as we officially bid farewell to these living legends of comedy.